Pizza night is always appreciated in these parts. All of us worship at the mighty pizza temple, supplicants of the tangy tomato sauce, gooey cheese, and delicious toppings. Last night LSS and myself had a dinner to attend. Still, I ordered two large pizzas for the kids, knowing that the extra slices would not be wasted. Indeed, the next morning the kids had pizza for breakfast, packed slices in their lunches, and were disappointed when they returned to find the refrigerator empty. I, too, had pizza for breakfast, then at 10:00 am decided I deserved more pizza because I hadn't eaten it the night before -- you get the picture. The mere notion of pizza drove all of us into some kind of frenzy. I like to imagine this behavior is a holdover from prehistoric times. 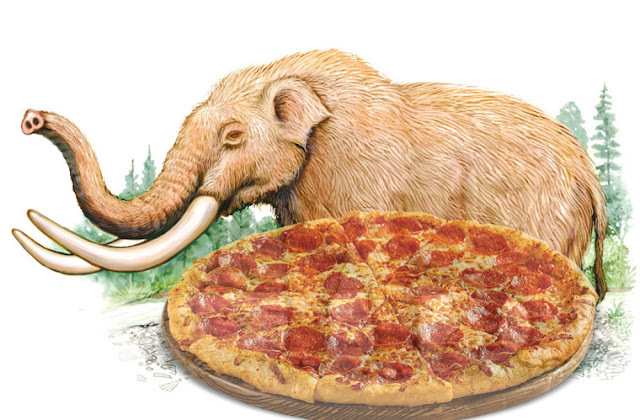 When a band of early humans finally killed a mastodon I like to think the excitement would be similar to pizza night. Prehistoric me: "Kids, have some more mastodon. 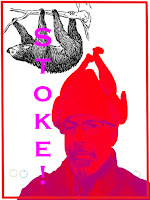 Add extra mastodon to the mastodon fritters." The notion that one can eat until satiation, either mastodon steak or pizza, strikes me as a universal joy, made extra special by knowing the next morning the good times will continue. I suppose this is the notion of feasting, which has been present for, well, time immemorial.